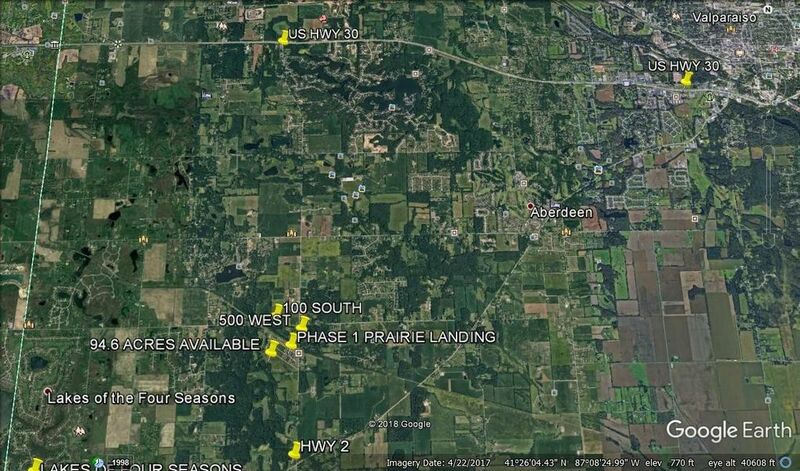 94.6 acres (+/-) of land originally planned to be Phase 2 of Prairie Landings Subdivision. The final plat was not recorded and thus any approvals are not considered to be binding. The property offers a large pond on the West end, a small creek, some wooded area, a rolling topography, an asphalt street that has not been dedicated to the County. The property would be ideal for a single family home or a few home sites or a development plan can be pursued. The property has frontage on 500 W and 100 S and provides access to US Hwy 30 to the North and Hwy 2 to the South. It is also approximately 3 miles East of Winfield and Lakes of The Four Seasons. This is an opportunity to purchase acreage with many different options available for future use.